Quickie Presentations for Any Moth Story!!! 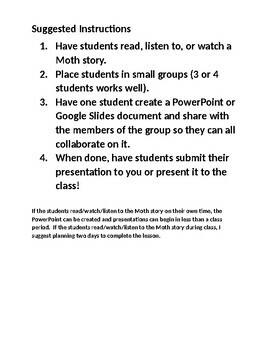 Are you looking for ways to incorporate The Moth into your classroom? 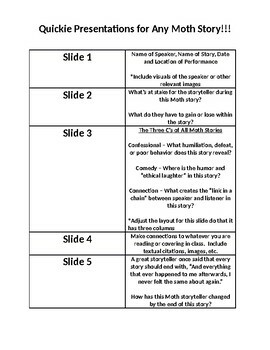 These step-by-step instructions for Quickie Presentations works for any Moth story!!! The Moth is a cultural phenomenon. These short, personal stories are told on stages all over the country. The Moth podcast is downloaded over 44 millions times per year, and the Moth Radio Hour is broadcast on hundreds of radio stations across America. Moth stories are perfect additions to your curriculum. They can be analyzed on their own for elements of storytelling, they can be added to existing units that they relate to thematically, and they are perfect independent reading assignments. Many schools even host their own Moth Story Slams! Check for comprehension by creating a Moth review with PowerPoint or Google Slides after reading, listening to, or watching a Moth story. Moth story performances are readily available on YouTube, the app store, www.moth.com, and in two Moth books featuring the transcripts of some of the most memorable Moth performances. However you want to use Moth stories in the classroom, this resource is the perfect supplement to get students thinking, working together, and utilizing technology.